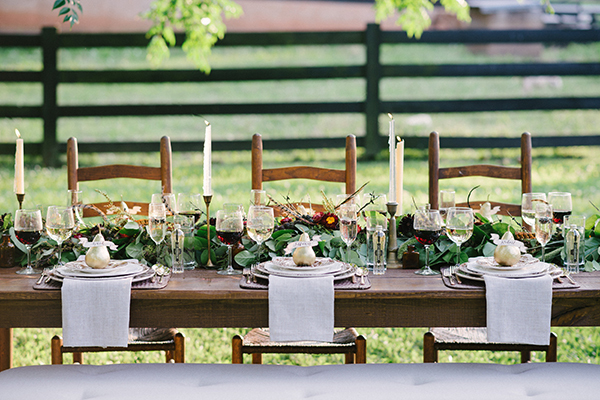 It’s hard to put into words just how remarkable this Thanksgiving tablescape is. Shot at the dreamlike Serenbe Inn a few years ago, it is abundant with tabletop inspiration for a Thanksgiving gathering, and every detail is truly timeless. The shoot actually took place on a scorching day in July, and anyone that knows heat in the South can appreciate just what that meant for the shoot (melting cakes, anyone?). But miraculously everything turned out even better than we could have imagined, and we find ourselves coming back to this shoot time and time again. As you search for inspiration for your own Thanksgiving tablescape, consider deep, rich colors and lush textures. (One Kings Lane sells a great variety of fresh and dried garland if you want to tap for a guaranteed show-stopper.) Varied candle heights can give visual interest to the table without restricting views and ultimately, conversation, and stacked plates always elevate the place settings, as I’ve learned. Lastly, thoughtful touches like personalized place cards and “I’m Thankful For” cards encourage guests to talk to one another and open up to reflect during this holiday time.